Stylish, simple and classic, this Certina DS Caimano automatic men's watch reflects the traditional values of the brand's Swiss heritage. 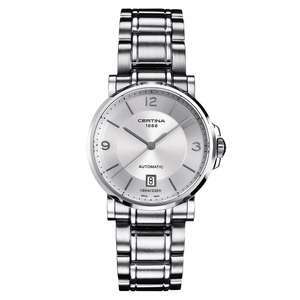 As well as undeniable style, protective features are built into every Certina watch to ensure lasting craftsmanship. This sleek design is fastened with a brushed and polished stainless steel bracelet and features a 38mm stainless steel case with a polished bezel. Scratch-resistant sapphire crystal protects the silver tone dial with baton and Arabic numeral hour markers, grey hands and a date window at 6 o'clock. Water resistant to 100m, this watch is powered by a Swiss made automatic movement. 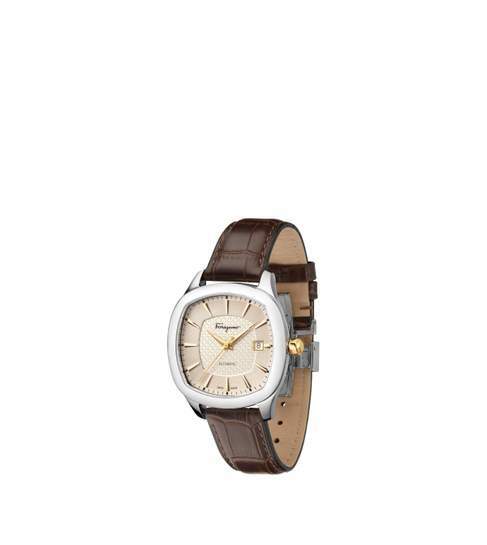 Leave a subtle, yet lasting impression for every occasion with this handsome Certina watch. C0174071103700. Had a couple of vintage certinas in my time which were nice. I like the look of this watch, without knowing much about it. EDIT: a quick search shows that this uses the ubiquitous, but quality Swiss ETA 2824-2 movement. This is the cheapest watch I've seen with this movement! Sapphire crystal is also expected at this price. Definitely a hot vote on this! Got a hot one for ya! I've seen this advertised as both a men's and ladies watch. At 38mm it's suitable for either. Nice watch, managed to order before it became order in store only :). Heat added! >Decent watch for the money. Voted hot. Please don't compare a smartwatch to a Swiss automatic watch! Smart watches are great for those who want the functionality but it's comparing apples to oranges. Ferragamo is just Timex really (Dutch) and Certina is owned by Swatch (Swiss). Some of Certina's DS watches cover the look and demographics (i.e. younger, sporty and larger dial, more complications etc.) of the Ferragamo so it's probably a matter of personal taste. This watch is more traditional than yours and it has a well tested movement and will undoubtedly be easier to resell and worth more in 10 years time, which might only be important if you flip watches regularly for your habit. It's all personal taste. Out of interest, which model did you get? Most of their watches appear to start at the £800 mark, so it sounds like you made quite a saving there. Nice watch heat added usual very low stock disappointed. Ferragamo is just Timex really (Dutch) and Certina is owned by Swatch …Ferragamo is just Timex really (Dutch) and Certina is owned by Swatch (Swiss). Some of Certina's DS watches cover the look and demographics (i.e. younger, sporty and larger dial, more complications etc.) of the Ferragamo so it's probably a matter of personal taste.This watch is more traditional than yours and it has a well tested movement and will undoubtedly be easier to resell and worth more in 10 years time, which might only be important if you flip watches regularly for your habit.It's all personal taste. Out of interest, which model did you get? Most of their watches appear to start at the £800 mark, so it sounds like you made quite a saving there. Ferragamo is Swiss Made like I indicated. below is the watch! I saw that one on ebay. Looks a nice and fashionable dress watch and routinely goes for quite a bit more than you paid for it! Uses ETA 2824 movement as well. Yeah, Swiss made as you say which means that the movement needs to be Swiss, it needs to be cased up in Switzerland and then inspected by the manufacturer within Switzerland. It doesn't mean the manufacturer has to be Swiss. That's why non-domestic companies like Timex, Hamilton etc. Can put Swiss made on their dials.